DON´T LOOSE THIS OPORTUNITY !! MAKE YOUR OFFER !! Fantastic house with 150m2 built and 86 m2 of basement. This house has a big garden, very nice with a barbecue, relax zone, a front porch and a terrace. The house is divided into 3 stories. The top floor, the main floor and the basement. The accommodation comprises 3 double bedrooms with fitted wardrobes on the first floor and 2 family bathrooms. The main floor has 1 bedroom, 2 family bathrooms, and independe a fully fitted kitchen, a spacious lounge / dining room with a chimeney and a laundry room. This property also has a private garage. 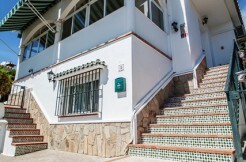 It has east-west orientation and is located in one of the best areas in Vélez-Málaga. It has a communal swimming pool and garden. It is close to all local amenities and restaurantes. Less than 2 km from the beach.